So I have been pretty overwhelmed lately by the catching up I have to do on The Amazing Adventures of Anne Kathleen. Every time I sit down to write, I don’t know where to start because we have done so much. So instead of staring at the many posts I have started to draft and not knowing where to pick up, I have decided that today I will share all the places our little Annie has been in her first ten months. Yes, tomorrow Annie will be 10 months! I can’t believe it, it feels like yesterday we were bringing her home from the hospital. In her first ten months, Annie has been on 15 flights. Yes, FIFTEEN. Eight of these flights have been over the Atlantic Ocean. She’s pretty much a professional by now. On her last trip back to the States for Christmas, toward the end of the flight, one of the flight attendants stopped by and said “Well, this MUST be this little lady’s second flight, I’ve never seen a baby so well-behaved on such a long trip before.” When I responded, “No, it’s her fourteenth,” the attendant’s jaw just fell to the floor. Whether it’s because she has lots of practice or just because that’s how our Annie is, she has not once fussed or cried on any of these flights. Knock on wood! She is a magnificent traveler and we need to keep it that way. I will be posting about each of these places and our time there for my future posts. But for now, here’s Annie’s travel log…. In May Annie traveled to the Abruzzo region of Italy, one of the country’s most mountainous regions, east of Lazio, the region in which we live where Rome is located. In June, Annie got to visit her mom’s favorite town in the Umbrian region of Italy: Orvieto. When Annie was almost three months, on June 24th, she made the trip to the United States for the first time. She spent almost two months in Chicago. In the beginning of August, Annie made her first road trip. She rode through Indiana, Ohio, and ended up in Annville, Pennsylvania, where she stayed for two weeks before her drive back to Chicago for her final week in the States. While in PA, she also ventured down to Baltimore to see the White Sox beat up on the Orioles, and to spend time with her aunt and uncle. Annie was 5 months when she returned to her home in Rome. A couple weeks later she was on the Orientation buses with our students to travel to Todi, Spoleto, Gubbio, and Perugia in the Umbrian region of Italy, north of Lazio. When she was 6 months, in October, she flew back to Chicago for her Great-grandfather’s Memorial Mass. Two weeks later she was on her way to Poland, where she visited Warsaw, Krakow, and Torun. In November, she flew back to Chicago for three weeks for her mom’s best friends’ wedding and got to spend her first Thanksgiving in Chicago. In December, she flew to Philadelphia to spend ten days with her PA family. Although her IL family decided to meet her there for a few days. On the 15th of January, Annie joined the students for a taste of Tivoli and visited Villa d’Este. She spent a long weekend from January 20-22, on another orientation trip to the Almalfi Coast where she visited Salerno, Pasteum, Agropoli, and Sorrento. This girl has been on every form of transportation one could think of. Buses, trains, airplanes, boats, cars. She’s visited museums, aquariums, art galleries, baseball stadiums, castles, mountains, seas, ancient ruins, farms, and fortresses. She received the sacrament of Baptism at St. Peter’s Basilica and has danced to the traditional live music of Napoli. She’s strolled past the Pantheon on many occasions, checked out the Roman Forum, the Colosseum, and Trevi Fountain. She’s gone for a dip in the Mediterranean, gazed upon historic works of art, and sat in the old town center of the once devastatingly war torn Warsaw. She attended Mass in glorious cathedrals, watched the buffalo at a buffalo mozzarella farm, visited universities in the States, Poland, and, of course, here in Rome. She has sat on the Spanish Steps and taken in the views of magnificent hill towns and seaside cities. I feel so blessed that we get to share the world with her. But I feel even more blessed that we get to share her with the world. Everywhere we go, EVERYONE falls in love with our precious baby girl. 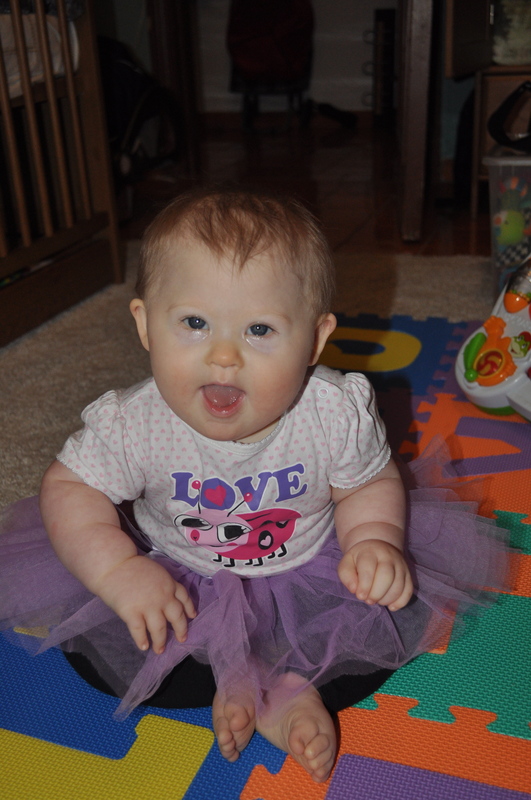 Some people think that having a child with Down Syndrome alters the quality of life for the parents and the child. So far, I think her life and ours has been pretty darn quality if you ask me. Just look at where she’s been! I am not sure which is a bigger deal…Getting over the worst bout of jet lag we have ever experienced OR the fact that my beautiful baby girl has begun to sit unassisted! So, I am pretty new to this mom thing. For the most part, I feel pretty dang comfortable in the role. I feel like I have been waiting my whole life to become a mother. I felt pretty prepared for it all. However, in the past nine months I have lived with more worry than my previous 29 years. I knew this would happen, I just didn’t realize how much a mother worries. Is my baby eating enough? What’s that rash? How many times will I wake up tonight to poke her to make sure she’s breathing? Is this poop normal? 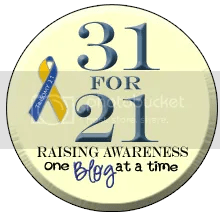 Add a diagnosis where doctors, books, therapists, society are constantly telling you your daughter will be developmentally delayed…and “No, we can’t tell you even a window as to when she will reach milestones, we don’t know if she will speak, etc. etc. etc….” As much as I try to live life day-to-day, trying to celebrate the present, and knowing that Annie will get there on her own time, there are days that I can’t help but worry with much anxiety and anticipation for the day that she can do the things we are working so hard to make sure she can do. In the past three months, Annie and I have been from Rome to the US and back 3 times. I am not sure how many of you have experienced jet lag, but it’s nothing compared to having a jet lagged baby. With each trip, because Annie is getting older and sleeping less during the day, the jet lag worsens. Chicago is 7 hours behind Rome time, so when we return to Rome, Annie will be up til around 5 or 6 a.m. and then sleep for her normal 9-10 hours. When we returned on New Year’s after our last trip, Annie was up until 6 a.m. for ten days straight. When this happens, as you can imagine, it takes a toll on all three of us. And with every trip to the states, we are missing out on Annie’s therapy sessions and then when we return we have to wait for her to get back on schedule to pick up where we left off. Enter: worried, guilty mom. Is the fact that we are missing therapy sessions hurting her? Are we delaying her development even more? For months we’ve been working on trying to get Annie to sit. And for the first few months I wasn’t worried. We worked with her everyday, and I knew she’d get there on her own accord. But when we returned in November after a three week visit with my family, I noticed an enormous lull in her progress. I started to freak out and obsess (something I promised myself I would never do). I cried and made a huge deal out of nothing…”if she doesn’t sit, she can’t crawl. If she doesn’t crawl, she’ll never walk.” I was making myself nuts and probably Annie too. We spent nine incredible days in PA for Christmas. I think I left my in-laws’ house 3 times in those nine days, a much needed break. I calmed and collected myself and let go. I’d rather her do it right and sit a year from now than rush her. So we returned to Rome to the nightmare of having a baby on the wrong time zone and I could not have cared less whether she was sitting or not, I just wanted her to sleep. Hell, I just wanted to sleep! Eventually we got back on schedule. We called Federica (Annie’s AWESOME therapist) and told her we were ready to start up again. This time after our return from the States, I didn’t focus on what Annie wasn’t doing. I let go and had fun. 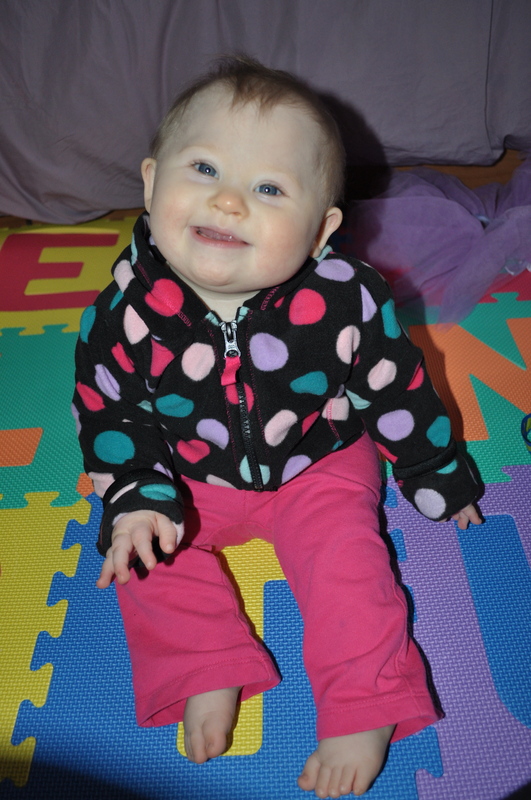 On Annie’s second day back in therapy, she sat unassisted for about a minute. The next morning five! Just hours after I sent this picture to all our family and friends, Annie surprised me and sat for 20 minutes with periods of clapping with hands off the floor for support. Pretty impressive for her first day! What I’ve learned from all of this is that our children truly feed off our energy and emotions. They turn to us and look for how they should be reacting to what’s going on around them. They know – even more than we do – when we are sad, worried, happy, or in hysterics. If any of you watched the latest episode of Modern Family, they nailed it on the head with Lily’s swearing to cheer up her dad. Since having Annie, I 100% believe all this. When Annie was first born and I was sad and worried because of her diagnosis, she literally did nothing. She hardly moved, she barely ate, she NEVER once cried. The morning I woke up a with a different attitude and with the epiphany that all I had to do was love my precious baby girl and focus on her and not the DS and let go, she began to interact with us. Not long after that, she finally nursed. The calmer I am, the more she accomplishes. When I worry and obsess, she senses this and shuts down. Annie I am sorry I lost it a bit in November. I’m working on it! And I am so proud of my sitting baby girl!